Thursday, April 25th, from 12:30 to 5:30 p.m. at Calvert City Church of Christ; and from 1 to 6 p.m. at Benton Elementary. Please call (270) 442-9141 for Thursday hours. 1st, 4th and 5th Sunday 7 a.m. to 11 a.m.
For your convenience, you may now schedule blood donation appointments online at www.redcrossblood.org. Donors may subscribe to Red Cross texting by sending redcross to 42227 or registering online at www.bloodisneeded.org . 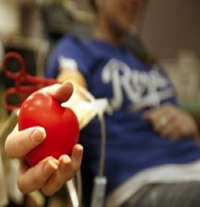 For some blood drives, you may schedule an appointment: Go online- log on to www.givelife.org. Go to “Step One: Find a Blood Drive”, and follow the instructions. Or call 1-800-GIVE-LIFE to find a blood drive near you! Eligibility Requirements for Blood Donation To give blood you must be healthy, be at least 17 years old, weigh at least 110 pounds and not have donated blood in the last 56 days. “Healthy” means that you feel well and can perform normal activities. Medical staff will examine your health history and take your temperature, pulse, blood pressure and blood count prior to donation. Your eligibility will be determined after the examination. For a more complete listing of guidelines and how they are affected by various medical conditions go to www.givelife.org, click on “being a donor” and then “eligibility guidelines”.